At some point this summer, you know you are going to need The Classic Zucchini Cookbook because at some point this summer, you are going to have a whole lot of zucchini to deal with. Maybe. Funny story about zucchini . . . Despite the fact that other people everywhere manage to grow and produce massive quantities of zucchini, we've never had the pleasure. I say pleasure because that's truly what it is. We like zucchini in a variety of forms and eat a lot of it when it's in season (i.e., when it is cheaper). One year some friends of ours gave us a gigantic zucchini plant in a pot that was healthy and thriving. "You won't need to do anything to it!" they said with a smile. "It will just produce. Watch and see." We watched. We saw the thing die a miserable death. It never grew a single zucchini. This year we decided to take extra precautions and plant four zucchini plants in various parts of the yard to find a suitable spot. Four zucchini plants in one yard might strike fear into the heart of your average gardener. But we are not average. So far, only one plant shows signs of having a will to live. 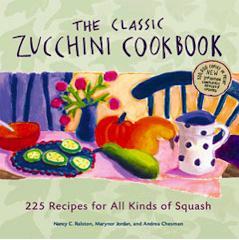 In anticipation of the wild crop of zucchini that we are going to have this year, I had to take a peek at Story Publishing's Classic Zucchini Cookbook . It boasts 225 recipes involving this beloved (or at least humored) green vegetable. I haven't actually made any of the recipes yet, but I wanted to review it and let you know in advance that I plan to make the following recipes with my bumper bumper crop! Depending on the crop, I'm also incredibly intrigued by the idea of "Zapple Pie with a Streusel Topping." (Lots of spices and chopped nuts are in order. How could you go wrong?) There is also a recipe for Zucchini Bars which is described as follows: "Think blondies made with lots of good stuff, like raisins and coconut, instead of chocolate chips. There's a healthy dose of fiber in these good-for-you bar cookies." Make of that what you will, I think it sounds interesting. One thing that I appreciate about this recipe book is that the recipes do not call for outlandish or unique ingredients. Most of the recipes in this book contain half a dozen or so ingredients which are quite common and/or easy to obtain. The majority of the recipes also have great appeal to me, personally (being fond of zucchini and all!) and do not look remotely complicated. Also, it should be noted that all 225 recipes do not focus exclusively on zucchini. The book is subtitled, "225 Recipes for All Kinds of Squash." While most of the recipes can be used with zucchini, some are strictly designed for use with pumpkins or butternut squash. The majority, however, do work with zucchini. Thank you, Storey Publishing, for shooting a copy of this useful book my direction! This cookbook could be very handy! And I have a wonderful recipe for what this cookbook probably calls "zapple pie." Mine was rather a "zapple crisp." I completely fooled people with that one--they REALLY thought it was apple pie/crisp! I'm a little envious for all of the fun Storey Publishing books you get to review :) I have "The Fruit Gardener's Bible" from the library right now and I think I'm going to have to purchase it! Just might be true for the "Zucchini Cookbook" too. You must be the first person I have heard of who has difficulty growing zucchini - but I bet my wife could kill it too. In a gallon ziplock bag, add olive oil, salt, and pepper. Coat thoroughly. Cook on your grill. It's marvelous. It's been too cool for zucchini the last couple summers here. Zucchini is a feast or famine plant. If you subscribe to Taste of Home (published in my home state of Iowa), there is an entire issue seemingly devoted to zucchini recipes. Also, I don't put squash out till around the first of June here. Too susceptible to powdery mildew, etc. otherwise. We're at 400 ft- might be OK two weeks earlier at river level. I have a friend who lives ~1/4 mi from her parents' farm but about 400 ft higher in elevation and her parents' daffodils are 2 weeks ahead of hers. That's how I came up with my estimate. Taia is absolutely right. If you've got zucchini you've really got zucchini--but if it's not going to produce, ain't nothin' you can do to get it going. My mom didn't have zucchini last year, despite planting her usual four or five hills. This cookbook sounds like an awful lot of fun. I love inventive recipes that manage to still use ordinary ingredients. Seeing all the "specialty" items in a cookbook wasn't quite so frustrating to me when I lived in a city of 200,000--but now that I'm in a town of 20,000, I really appreciate those recipes that keep the ingredients simple. I love cooked zuchhini, stir fried with tomatoes, garlic and onions. Yum! 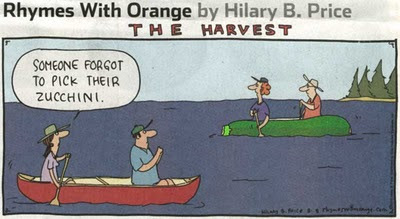 Here's hoping yours takes off and you get a bumper crop!. This book sounds like it's right up my alley! We were given a good bit of squash and zucchini last year and really enjoyed experimenting a bit with it.